Rio Pretty Woman is the kind of cow we don't mind giving some time to develop. 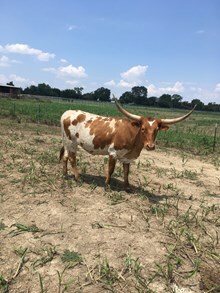 Her horns may look like they are going north, but we are going to be patient because when they start to roll out, it will be worth the wait! Look at her Grand Dam, L Easy Woman's horns, it will give you an idea of her potential.